Practice Fusion has become an increasingly popular option when providers are considering EHR integration for their practice data management. It’s the only free EHR program that is certified for Meaningful Use 2014. It’s currently used by over 112,000 providers, including 40 specialties and maintains over 80 million patient records. But with Practice Fusion and other EHR programs, providers can still spend way too much time in front of their computers instead of with their patients; much of their work day and after hours at home consists of typing and clicking to enter patient data. Many providers complain that this tedious, time-consuming work is a major burden on their quality of life and their love of practicing medicine. Dragon® Medical Practice Edition helps minimize this aspect of getting information into an EHR by allowing providers to talk rather than type, considerably speeding up the process of transferring patient data into electronic format. To streamline EHR processing, providers should consider partnering Dragon Medical Practice Edition 2 and Practice Fusion to get the most out of their EHR. Dragon Medical Practice Edition 2, designed for smaller practices of 24 or fewer providers who want to make the transition to their chosen EHR, is fully compatible with Practice Fusion and enables users to maximize its potential. Practice Fusion’s EHR system includes medical charting, e-prescribing, online booking and scheduling, online referrals and messaging. Its lab, imaging, and billing modules integrate with a network of third-party laboratories, medical imaging centers and medical billing services. Practice Fusion’s EMR for iPad is scheduled to launch soon. A provider can get started with Practice Fusion easily by signing up online. Free support is available for EHR setup and usage, Meaningful Use, PQRS, and ICD-10 incentives; and technical issues. All Practice Fusion offerings are HIPAA-compliant. 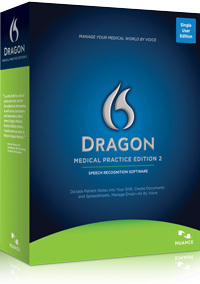 So for those providers who have decided to use Practice Fusion as their EHR, a good option to make it work most effectively for your practice is Dragon Medical Practice Edition 2.